Hammered Dulcimer Recording From 1908! Here’s an Edison cylinder recording of a hammered dulcimer solo recorded in 1908! 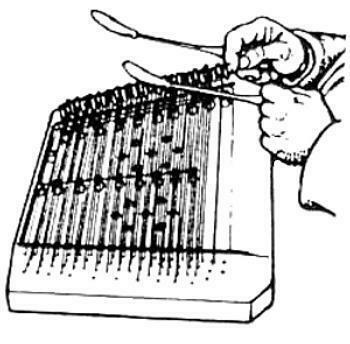 No big, fancy dulcimer with extend range, additional chromatic notes or damper pedals here, just the skill of a player on an instrument that sounds like it had between 9 and 12 treble courses and possibly a smaller number of bass courses. I am increasingly drawn to smaller, simpler hammered dulcimers. At first I missed the lower bass notes but there is a sense of freedom, ease and intimacy I experience when playing a simpler, smaller instrument. Glad you enjoyed it Joe. Charming! And exactly one century ago… The good things in life don’t change.